George Simmonds played four games for Melbourne in 1924, his only VFL season, debuting at age 29. The AFL had him as being born 16 July 1895 on the Historical Stats website and presumably this is still regarded as his official DOB. He was George L. 'Nugget' Simmonds and "from Kerang" according to The Encyclopedia of AFL Footballers. He is credited with being just the second aboriginal footballer to play in the VFL, with only Joe Johnson in front of him. The mystery involves his age, and did the same player play with Richmond Seconds (1925-27) and later at Northcote in the VFA (1930-38). The indications are very strong that it is the same player, but if so he would have been an unlikely 43 by the end of his VFA career, if the official DOB is correct. 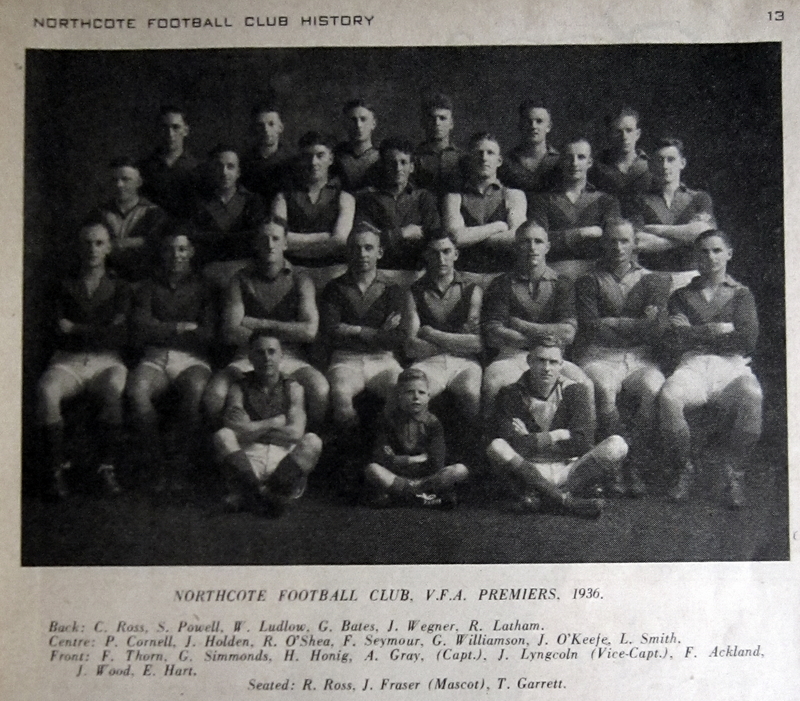 I started looking into this after seeing his name here:- http://boylesfootballphotos.net.au/Northcote Senior Team 1933 (SLV 122_059) and noticing there could be a serious discrepancy regarding his age. The player in the photo may well be indigenous (or even of African heritage), and while I haven't found anything that says the 1924 Melbourne player George Simmonds was the same one who ended up at Richmond Seconds a year later, the odds against there being two aboriginal (?) goal-kicking forwards with the same name playing at about the same time are extremely high! Permit G Simmons Kerang to Melbourne (VFL Record 1924 Round 9 page 28). Chronology George “Nuggett” Simmonds kicks a club record (all grades/competitions) eleven goals for the Cubs. http://trove.nla.gov.au/ndp/del/article/72676619 (The Horsham Times 1928). "Coming from the Richmond Seconds to Murtoa, Simmonds has proved a wonderful"
MURTOA'S LOSS. Geo. (Nugget) Simmonds, Murtoa Football Club's sharpshooter and Wimmera's centre forward in inter-league matches, will take his departure for Melbourne this week. He will carry with him the good wishes of many admirers of a clean and clever footballer. http://trove.nla.gov.au/ndp/del/article/4084463 Permit G M Simmonds Murtoa to Northcote (1930). http://trove.nla.gov.au/ndp/del/article/4077764 This says "Simmonds, late of Richmond" early in 1930.
http://trove.nla.gov.au/ndp/del/article/86559613 This has him aged 26 in 1935. If he really was 26 in 1935 he would have been born c. 1909, certainly nowhere near 1895. So could George Simmonds have been just 15 or so (and not 29) when he debuted for Melbourne in 1924? This does not look like it would be the aboriginal footballer to me. Could it be they accidentally ended up with another person's DOB etc? http://trove.nla.gov.au/ndp/del/article/155767933 (1925) Permit- George Simmonds from Melbourne to South Ballarat. This is a bit confusing, as I haven't found anything that says he went from Melbourne (or South Ballarat) to Richmond Seconds in 1925. From the information above I have two questions. 1) Was George Simmonds at Melbourne every identified as 'Nugget' in contemporary sources? George Simmonds was granted a permit to play for South Ballarat from Melbourne in May 1925 ( The Age 15 May 1925 at page 7). There sadly is no Ballarat centric paper on Trove fro 1926. So he leaves Melbourne in 1925 early. Just also a comment. Presume no fact from the AFL as the truth and recheck every date of birth, name, everything that has been stated by the AFL. Go to ancestry and check every detail. Also remember that if George was an aborigine, from what I understand, he would not have been allowed to vote until at least 1966 so he will not if an aboriginal be recognisable that way. from Melbourne (or South Ballarat) to Richmond Seconds in 1925 (or 1926). I had been puzzled that he was supposed to be at South Ballarat in 1925 when the Tigerland Archive website (link above) had him as being at Richmond Seconds 1925-27. He gets a mention as playing for Richmond Seconds in rounds 1 & 4 in 1925, but nothing after that in that year. It seems obvious he just played there while waiting for his permit/clearance to South Ballarat to come through. The Age 28 April 1925 p.15 says "Kerang. Two star footballers leave this week. ... and G. Simmonds, who played with the Melbourne club last year, has decided to play at Ballarat." Simmonds is back at Richmond Seconds in 1926 and in the team for round 1, and stays at that club until the end of 1927. He's with Murtoa in 1928-29 before heading to Northcote in 1930. *The 1926 report on Prahran prospects actually has Adams from Richmond Juniors, the Simmonds mentioned is from North Melbourne Juniors. I strongly suspect that George Simmonds was not an aboriginal, and that he may be of African origin. His story could well be like that of Norm Le Brun and Norm Byron ( http://www.footyalmanac.com.au/the-poet-laureate-of-old-fitzroy/ ), two players from yesteryear who until very recently were believed to be indigenous, but proven to have different heritage. Looking at the two photos Michael Riley has posted, I'd say there's considerable doubt. I am still just assuming that the George Simmonds who played at Melbourne in 1924 is the same person who ultimately ended up at Northcote. It's probably 95% likely, just not yet 100% certain as I'd like it to be! Anyway, looking at the photos (from 1933 and 1936), if the official DOB is correct, he'd need to be c. 38 and 41 (respectively). Not likely! I'm not a member of Ancestry.com, so I presume I can't access too much on that site. If you (or anyone) could check George Leslie Simmonds - born at Bendigo in 1895 and died at Kerang in 1973 it would be very handy, and also see if there was a George M? Simmonds out there somewhere. Our man was probably born c. 1909 (though it could easily be that he wasn't born in Australia). When he went from Murtoa to Northcote the paper had him as G M Simmonds. As I've said previously, I think someone got the DOB and other details mixed up, and they ended up with a DOB belonging to someone else. Again, if Melbourne George and Northcote George are one and the same, since he was supposed to have been born in 1895, by 1938 when still playing in the VFA he would have been 43. Also not likely!! There was a time a little while ago, when teams were rushing to find their first indigenous player and not bothering about the history too much and I think this is one of those occasions. I also looked up Simmonds and football and aboriginal, nugget and even perjoratives such as "n.....r" or "d...ie" given we were talking about less enlightened times. No dice except for one reference of nugget and nugget was often used as a nickname for a short statured person. I should have mentioned he did occasionally get called Simmons in the papers, though Simmonds does appear to be correct. I should add that when "researching" this story I always found it odd that while contemporary Doug Nicholls was often referred to by newspapers as coloured, there was (almost) no mention of skin colour regarding George Simmonds. Great research all, I will be updating his Demonwiki page accordingly and adding the note that he may not have been indigenous after all. On a related topic I'm interested in a player called "Johnson" who was recruited in 1897 (http://trove.nla.gov.au/ndp/del/article/9158422) and is described as "Captain of the Coranderrk", which as far as I can tell was an Aboriginal reserve near Healesville which was still active in the 1890's despite attempts to shut it down. There's a possibility that he is the same person as George Johnstone (http://demonwiki.org/tiki-index.php?page=George+Johnstone) who I have not been able to find an origin for yet, and if he was this may make him the first indigenous player in VFL history - having played in Round 1, 1897. There's no indication that they are the same people, and it is a very common surname, but if I can confirm that Johnstone is from somewhere other than the Healesville area I can put 'Johnson' aside as a probable indigenous recruit who never played seniors. There's a possibility that he is the same person as George Johnstone (http://demonwiki.org/tiki-index.php?page=George Johnstone) who I have not been able to find an origin for yet, and if he was this may make him the first indigenous player in VFL history - having played in Round 1, 1897. There's no indication that they are the same people, and it is a very common surname, but if I can confirm that Johnstone is from somewhere other than the Healesville area I can put 'Johnson' aside as a probable indigenous recruit who never played seniors. In case you're not aware, the Healesville Guardian gives a very good description of Coranderrk matches. One team selection in 1896 suggested there were two Johnson's playing at the time. You may find something in 1897 that tells what happened with the Johnson who was "Captain of the Coranderrk." It will be quite a story if this turns out to be the player who debuted for Melbourne in 1897! Thanks for the lead, will look into it more. Maybe not such a good lead, sadly, as Coranderrk for some reason either aren't playing regular matches in 1897, or are no longer in the competition that the Healesville newspaper covers. I'll have a look at Richmond FC Minute Book of 1924/1925 to see if it references anything about where he came from before Richmond. (It may take a while as I don't have access to it at the moment). I think I have a candidate. George matherson greyville Simmonds born in Richmond on 27 November 1905 and therefore 19 at age 24. According to the electoral roll he is listed as living in Melbourne in 1931 and 1936. Thanks a lot for doing that. It doesn't match with the age given for Simmonds in the Tasmanian paper (26 in September 1935) but wouldn't surprise if the paper was a bit out. 1905 is also much more likely than 1895! Being born in Richmond is probably another decent plus, as well. Just in case you haven't found this yourself:- http://trove.nla.gov.au/ndp/del/article/60279290 (Healesville Guardian 28 August 1896). Coranderrk---G. Johnston (captain) G. Johnston is mentioned twice as the captain, four times altogether. The spelling of the last name is always the same. T. Johnston also played for Coranderrk. I had seen McDougall named as captain for a couple of games earlier that year, he was named as playing in this game so clearly had been replaced. Johnson is named as the captain, T. Johnson is named in the team. I really hope the Coranderrk player is the one who played for Melbourne. You'll have made a brilliant discovery if so. Given the almost complete lack of aboriginal players in the VFL's first 50 or so years, it will be wonderful if it's proven that one played in round 1 1897. Ideally, no player with the name Johnston (or similar) will be found at Melbourne in 1896, leaving the Coranderrk man as the most likely 1897 player. I've read several Melbourne match reviews from 1896 and seen no mention of a name like that. I have noticed that the spelling of surnames back then could be very dubious e.g. Fred McGinis, acknowledged as one of the competition's early superstars, would often be McGuinness! Thanks for that, my match reports from 1896 are a shambles at the moment with nothing more than scores for most of them but have never seen a Johnston/Johnstone/Johnson in their either. My knowledge of the indigenous game of that era is terrible but I'm wondering if perhaps the Coranderrk might have had a white captain who lived locally. Have been in touch with a couple of other history gurus and will post any extra findings. Indeed, it's not out of the question that he could have been a white man. I've seen no mention of his skin colour/race in any match report from the games he played in 1897-98, which would be surprising if he was indigenous. I've looked at The Age, and am almost to the last of his games in The Argus. In fact, he gets almost no mention at all for any reason. All I've seen is this in The Argus 1 August 1898 - rd. 12 game ( http://trove.nla.gov.au/ndp/del/page/311026 ) where it has - "Johnson" and "Moore" both played well back, Why they have those two names in quotation marks is a mystery, Moore wasn't meant to be playing at all, so perhaps the writer just wasn't sure who was who. I'll keep looking, and try The Australasian as well. It's very frustrating that team lineups are nowhere to be found for these early VFL games. He did play until 1938 at Northcote. I've only mentioned his (possible) age in 1935 because it's shown in the Tassie paper, and it's been about all there is to go on. Well 1938 would make him 33. He's a prospect therefore for being the same bloke the whole way through.I say prospect because to rely on ancestry alone without other data is problematic. That said the fact of someone debuting at 29 without a comment as to his age is not plausible in my view. Some time ago Col was told by a relative, who clearly recalled seeing 'Nugget' Simmonds playing for Murtoa in the second half of the 1920s, that he had previously played with Melbourne and he'd been told that he was an aboriginal. The AFL still has him as George Leslie Simmonds, born 16/07/1895, died 15/01/1973, and that he was cleared from Kerang to Melbourne. This matter is still being investigated and I'll be informed as to what the conclusion is. It's good to see that this will be seriously looked into, now having some sort of a connection between George at Melbourne and George at Murtoa is very handy, because we know he went from Murtoa to Northcote. The big question remains (unless you believe he could still have been playing in the VFA at 43), when was he really born, and what age was he when he debuted for Melbourne. I'm really hoping the Tasmanian newspaper had it right when it said he was aged 26 in September 1935, as it would mean he debuted for Melbourne aged 15 or 16, not 29 as the records currently have it.